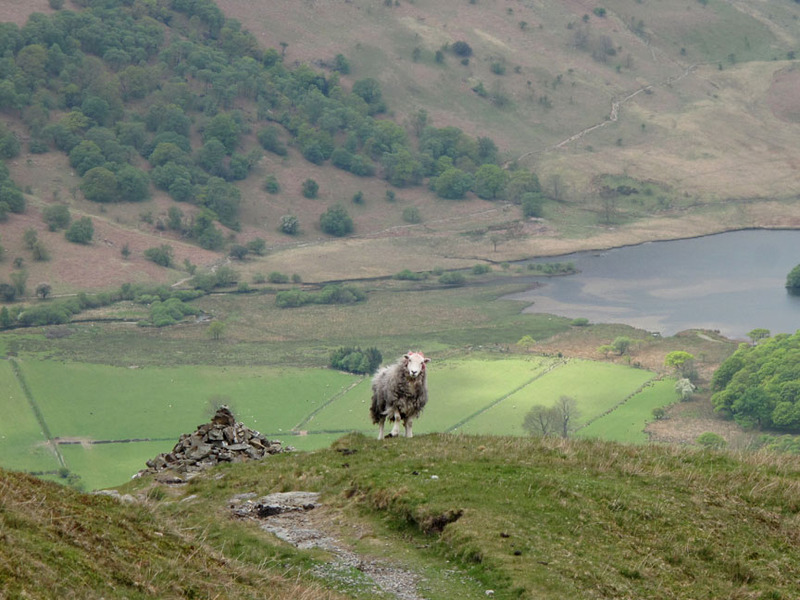 Dale Head to Buttermere, hostel to hostel. Date & start time: Thursday 20th May 2010, 10.35 am start. 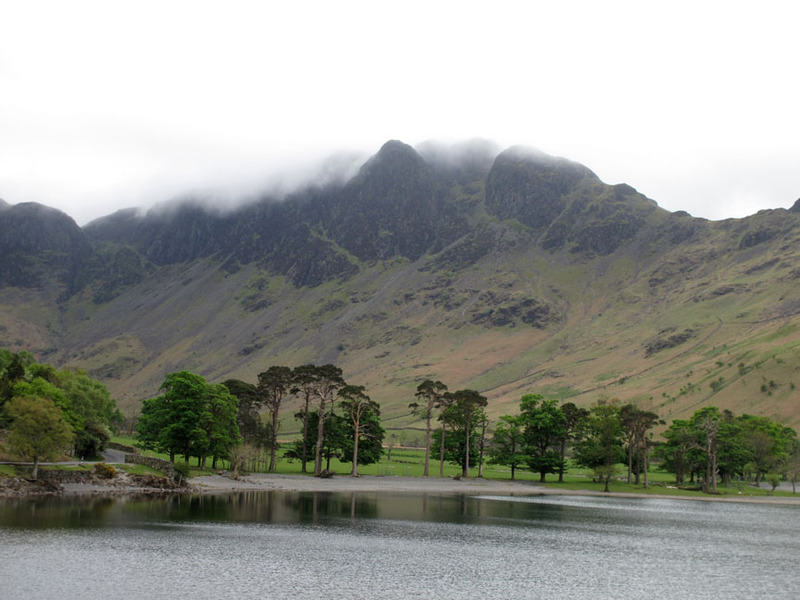 Places visited : Yew Crags, Dale Head, Hindscarth, Robinson, Buttermere Moss, Buttermere. 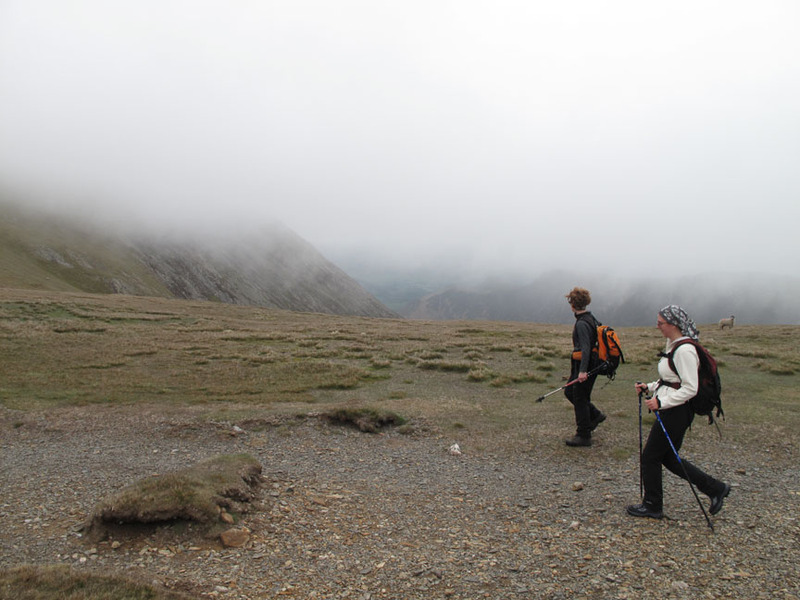 Walk details : 6 mls, 2225 ft of ascent, 2875 ft of descent, 3 hrs 25 mins. 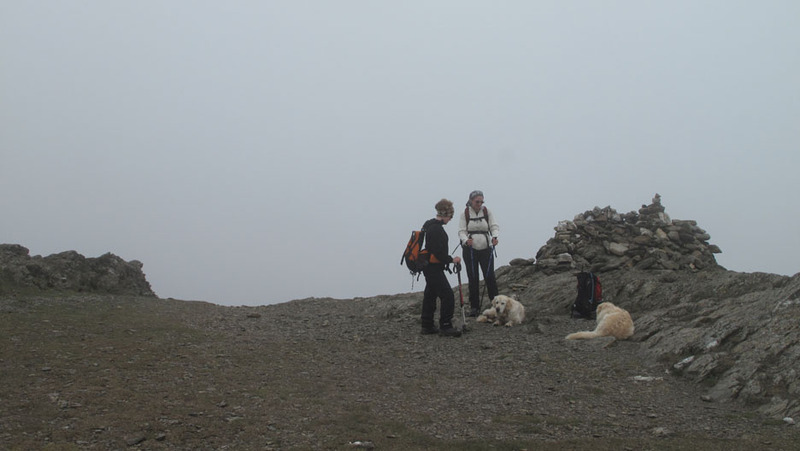 Highest point : Dale Head 2473 ft - 753 m.
Walked with : Kathy and Louise and the dogs, Harry and Bethan. 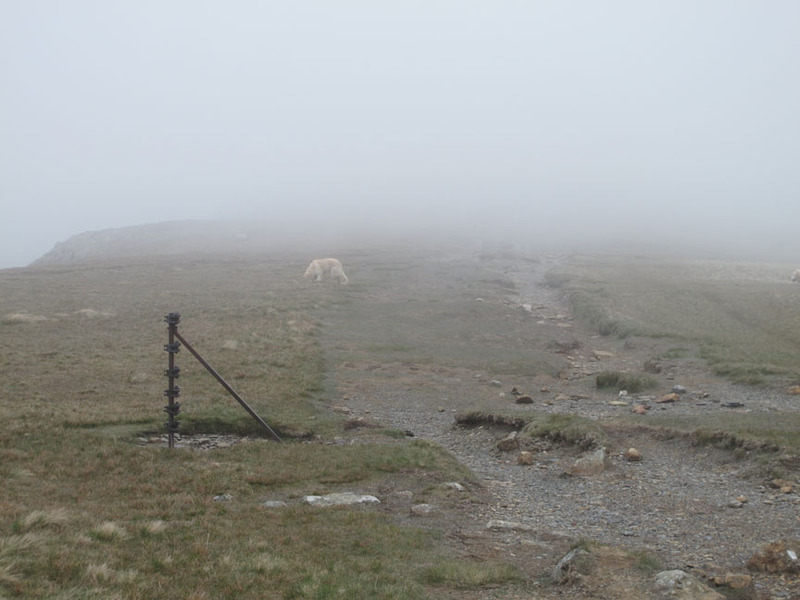 Weather : Overcast with cloud touching the tops. Surprisingly warm. 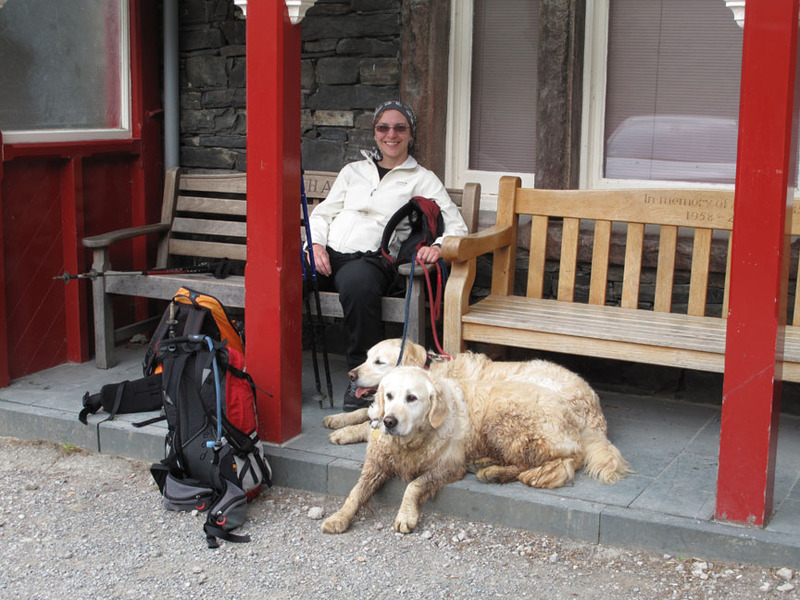 Friends of our daughter phoned to say they were staying locally and would like to join us for a walk. 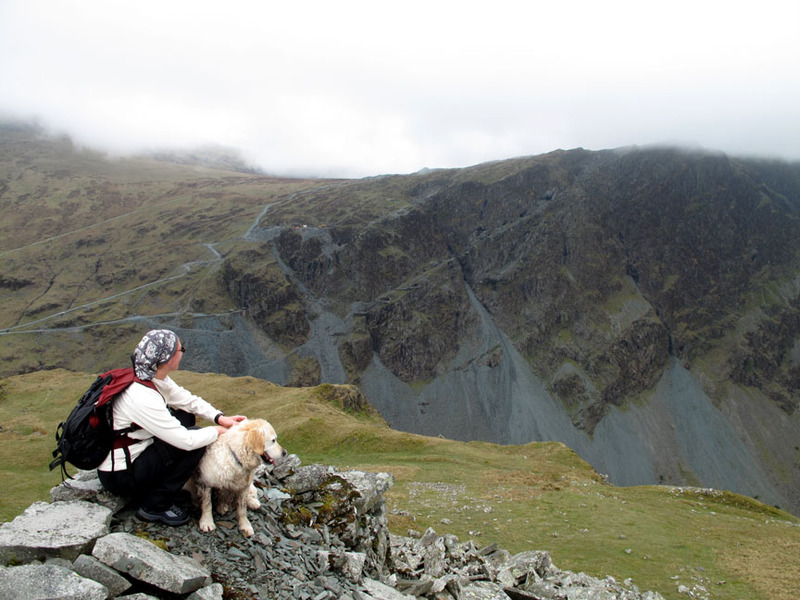 Never one to turn down such an opportunity, the dogs and I go off to to meet these new people at Buttermere. I wonder who they are and what they would be like ? [ Ann stayed home due to catching man-flu (oops- my fault !) but mine was fading fast and the fresh air would make it fade even faster. Kathy and Lou . . . these were my walking companions today . . . honest I'd never met them before ! 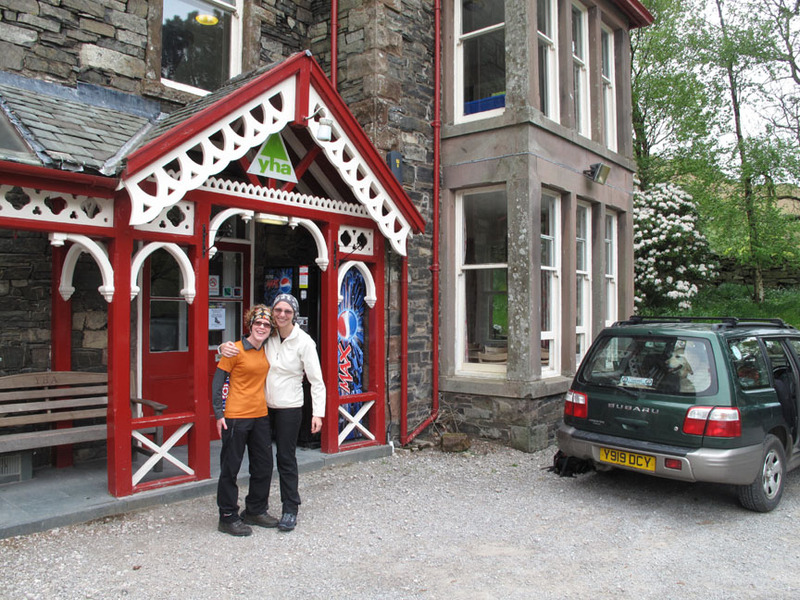 We decided on a Honister to Buttermere walk, ending back at the YHA Hostel that they were staying at overnight. 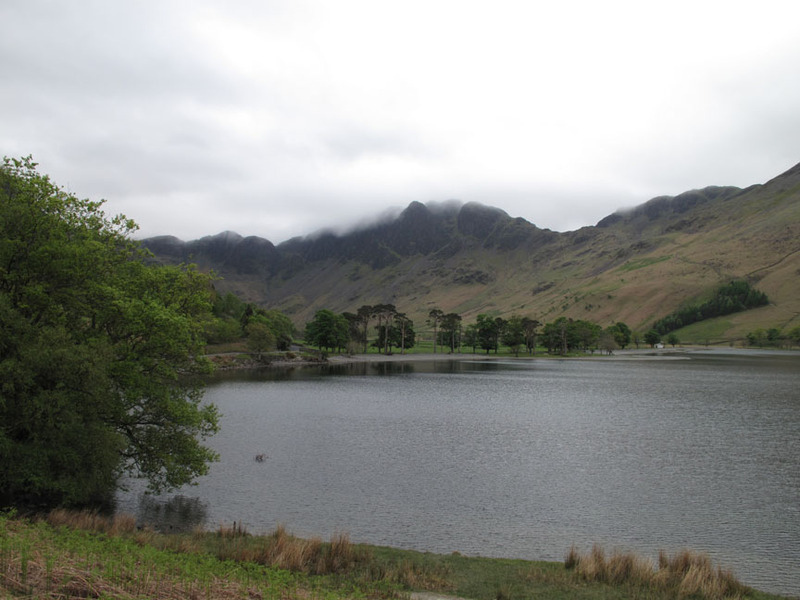 Naturally one has to pass the head of Buttermere and my favourite stand of trees. 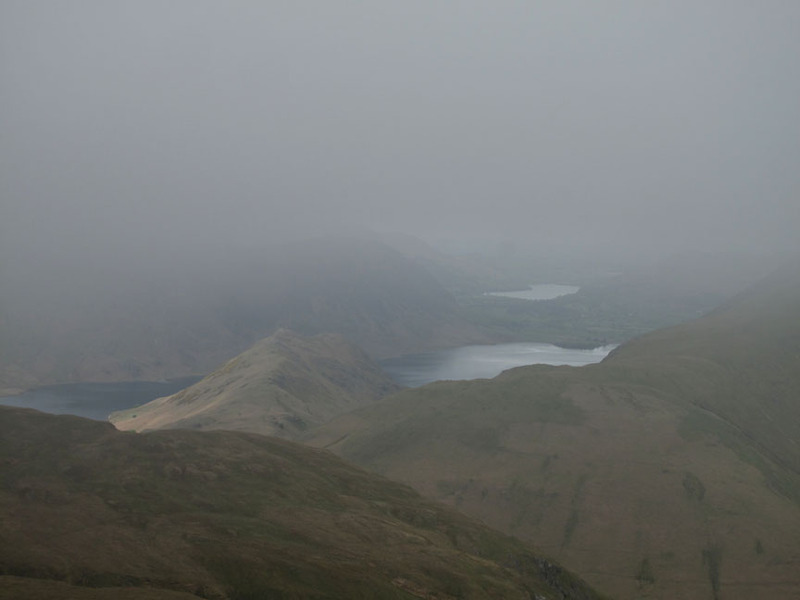 Today the low cloud swirling through the summit crags made the view very different from a recent visit. As it happened we parked near, and started our walk at another hostel . . . Honister. 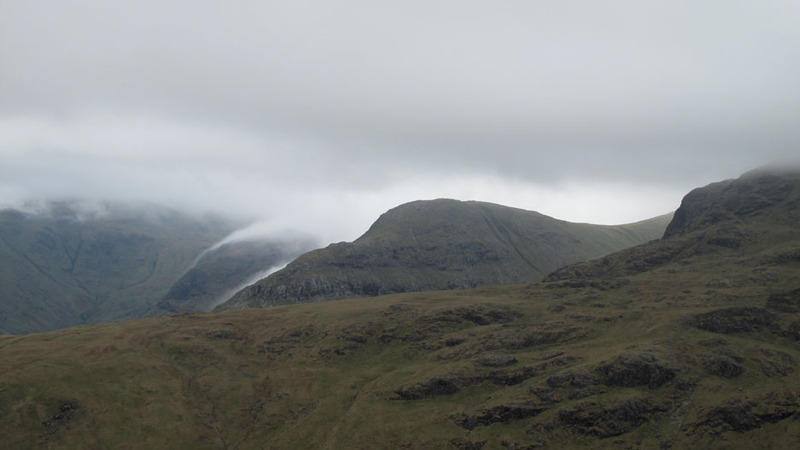 Cloud just touching the top of Honister Crags as we set off for Dale Head. 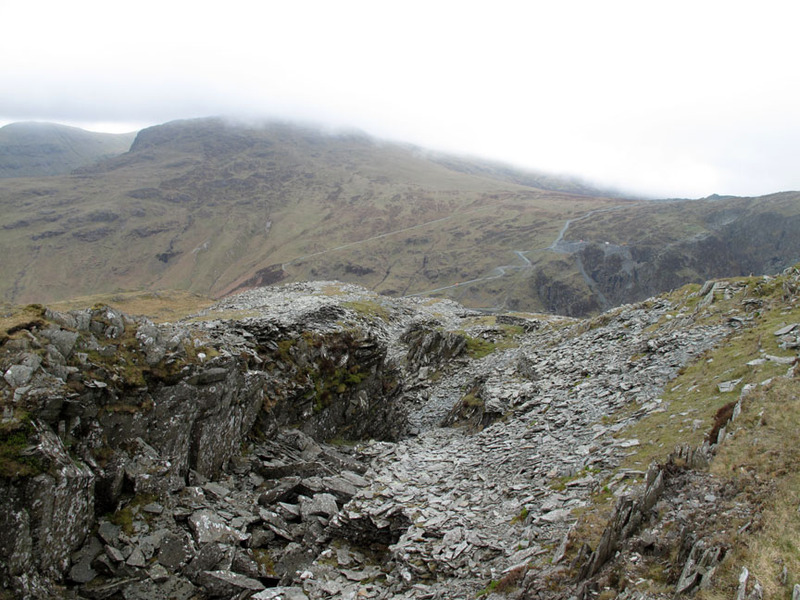 The old incline, now the route of the first Via Ferrata. 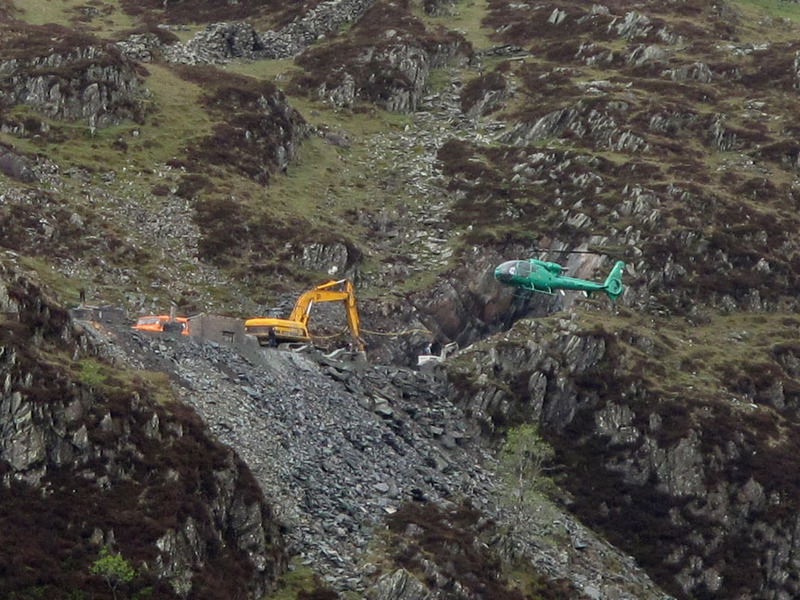 A keen eye may spot a green machine flying up across the crags. 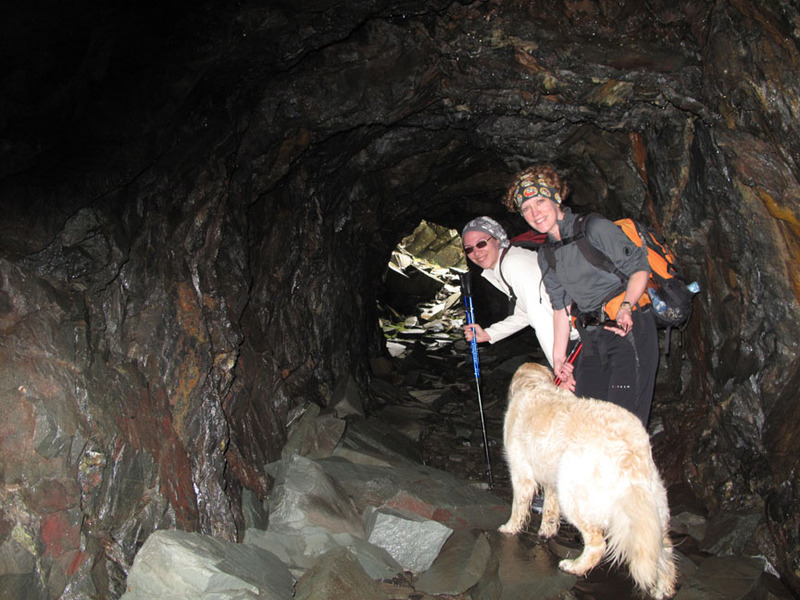 Mark Weir calling by to check out some work at one of the mine entrances. here it is "flowing" around Base Brown and down Grains Gill. and Kathy, who had seen my earlier pictures asked to go across and have a closer look. 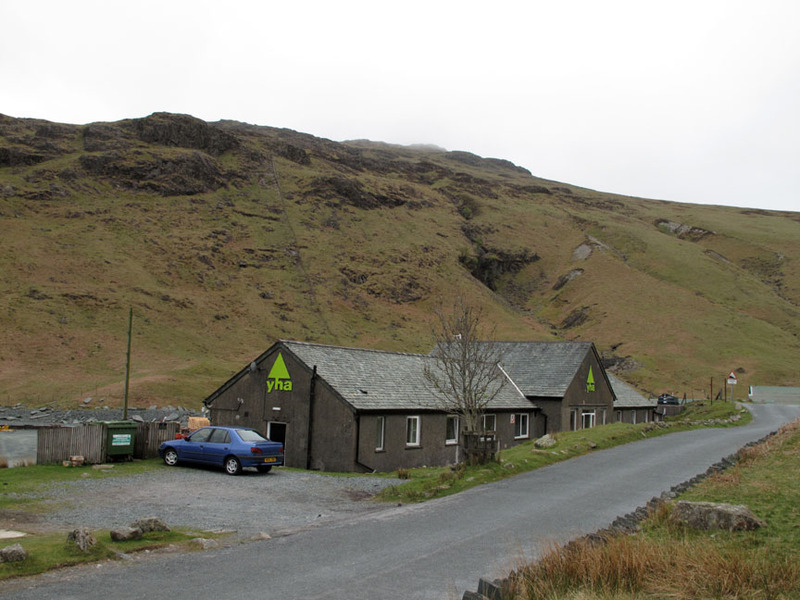 Some of the old mine buildings. 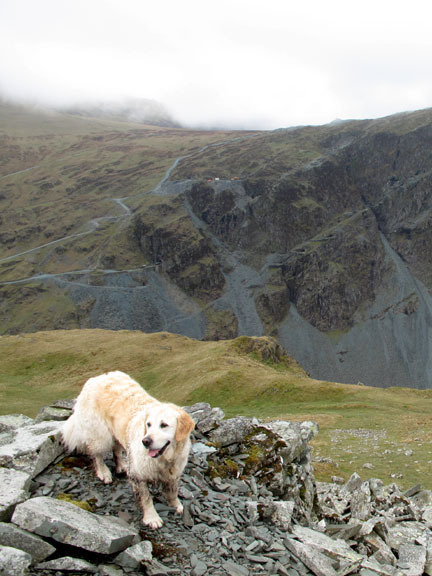 Harry at the outer end of a small waste tip. Lou and Harry stopped to take in the view for a short while. That looks interesting . . . can we go in there ? As it happens I had been through here before . . . and the two dogs were confident too. 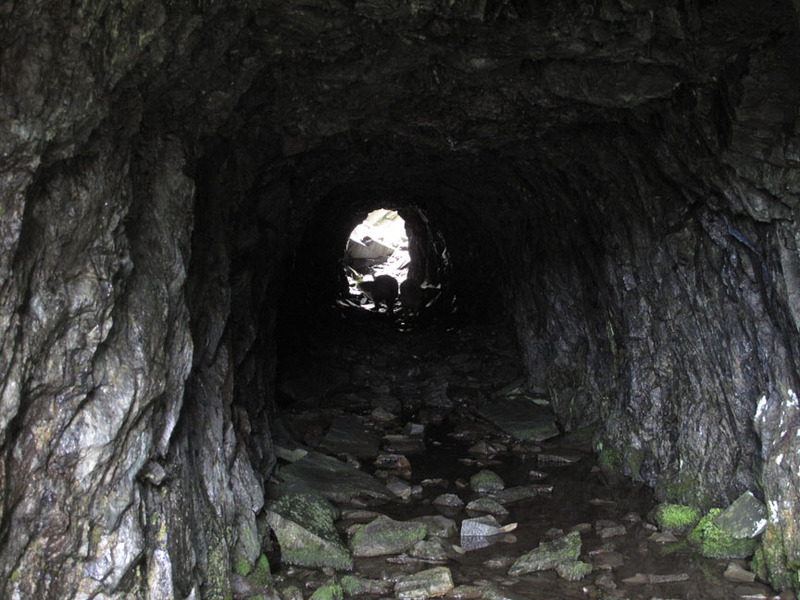 but otherwise it seemed this small service tunnel was safe enough to pass through. It led out to a small but deep quarry . 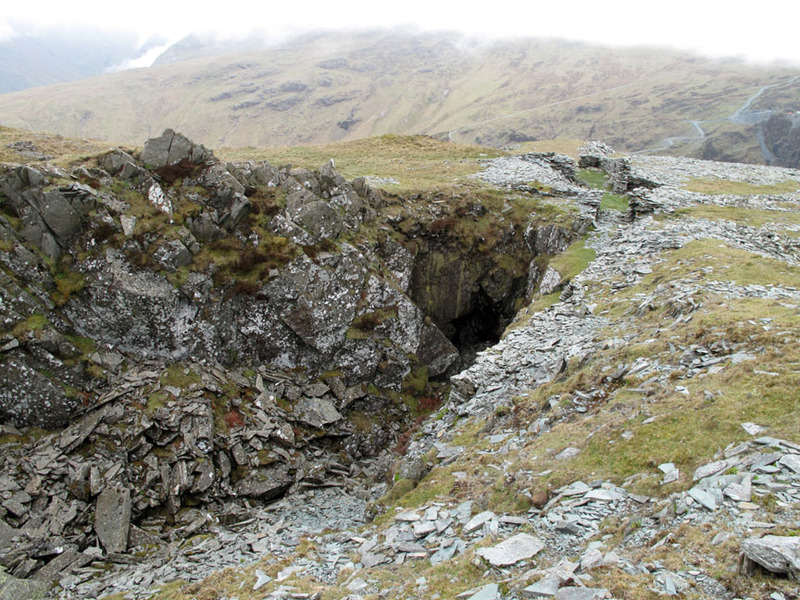 . . from where we could scramble back out onto our original path. Mmmm . 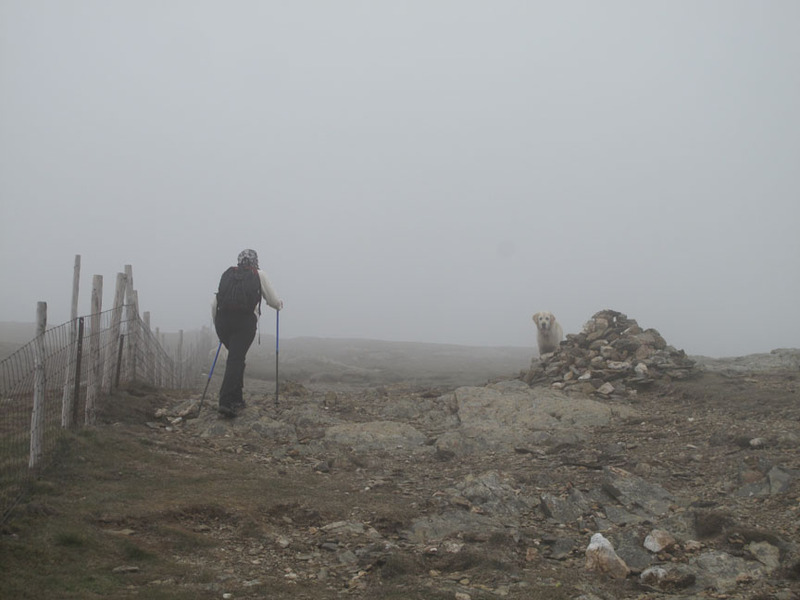 . . soon after that we lost visibility. 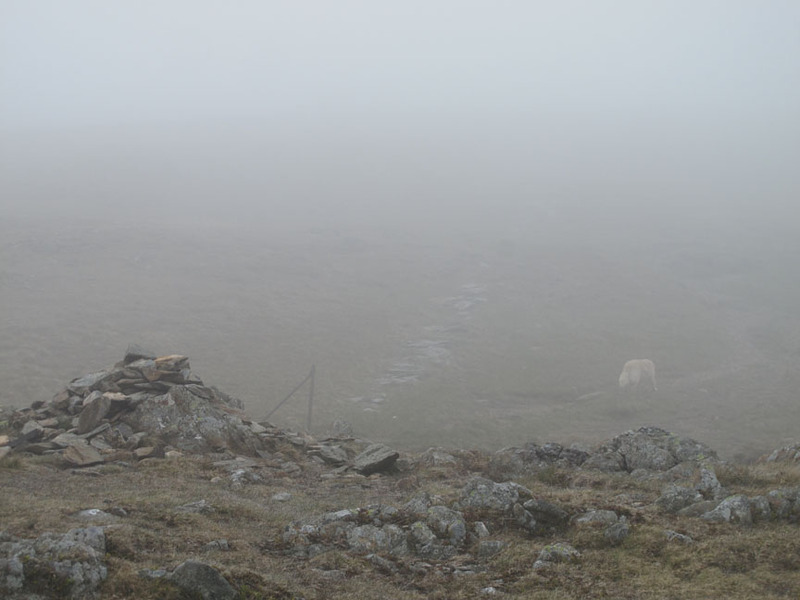 The summit is somewhere up there just beyond the two Herdwick sheep ! Sorry those weren't sheep after all . . . 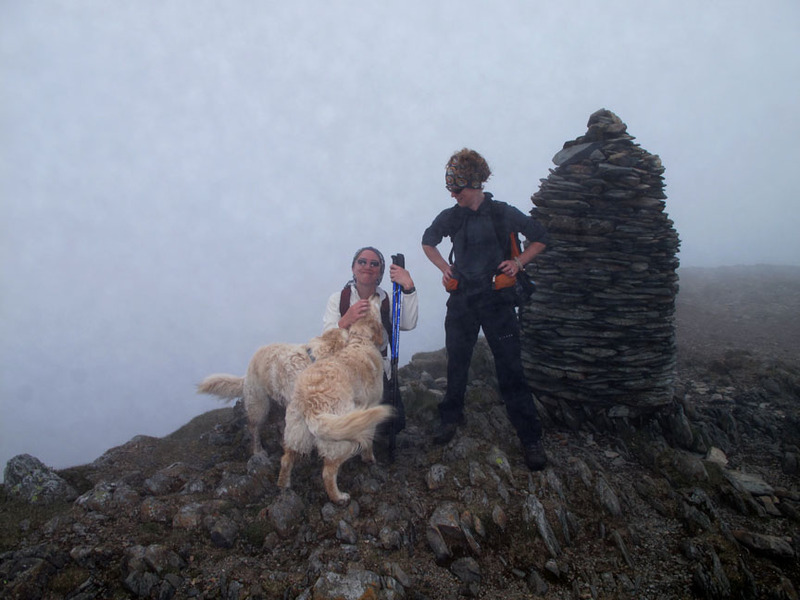 But the summit cairn was up there as expected. 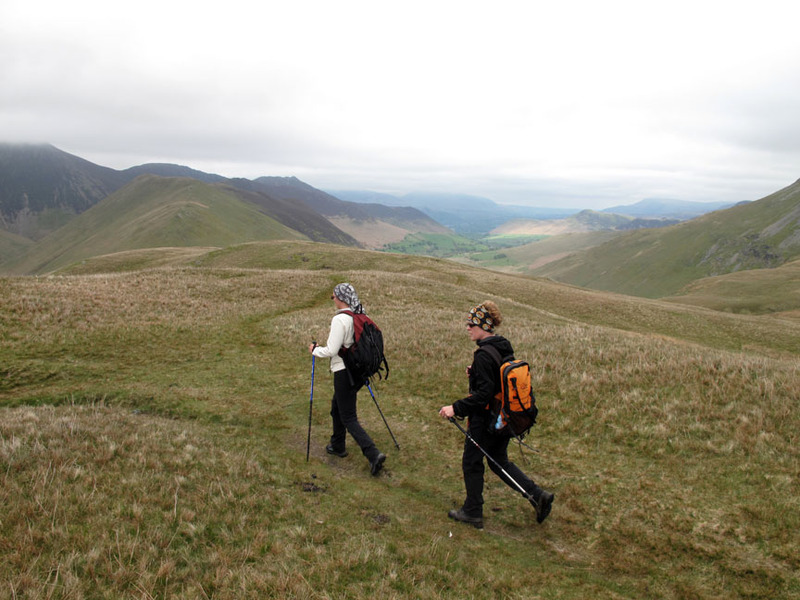 We turned left and followed the ridge down towards Hindscarth. 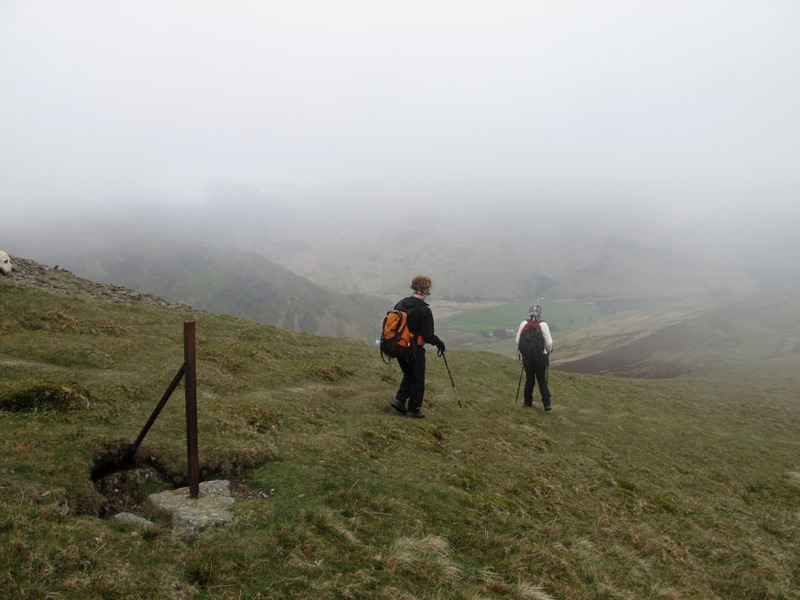 On Hindscarth Edge we just dipped down out of the cloud and had the briefest of views down either side. On the way across to Hindscarth Lou spotted a bird in the water. It was standing up to its haunches in the pool, absolutely stationery, so much so that we were worried about why it was there. I back-tracked slightly to get a closer look and it continued to stay absolutely still . . . ? We were thinking it may have been stuck . . . but then it upped and flew away . . . its white tail flashes showing as it went. 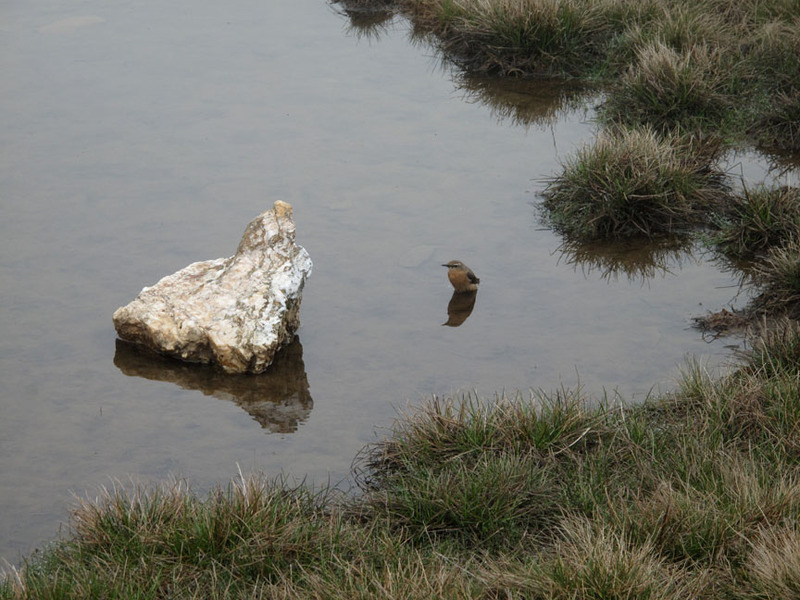 I thought it may be a Meadow Pippet, or it could be a Rock or even the rarer Water Pippet . . . Any ideas ? Do please email me. Thanks Nigel . . . that looks like it, though my bird book didn't show it with such dark wings. It certainly " flew off low showing dramatic white wing feathers " . 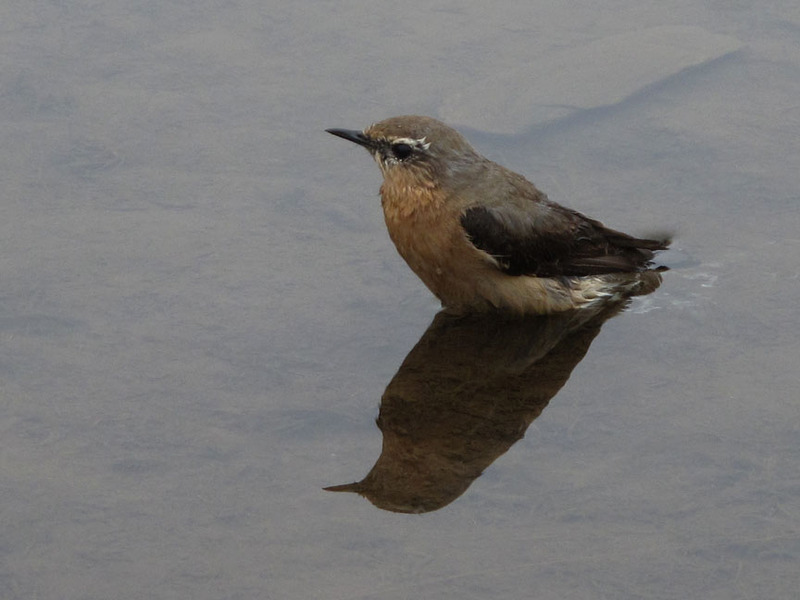 . . a summer migrant to upland northern and western Britain. 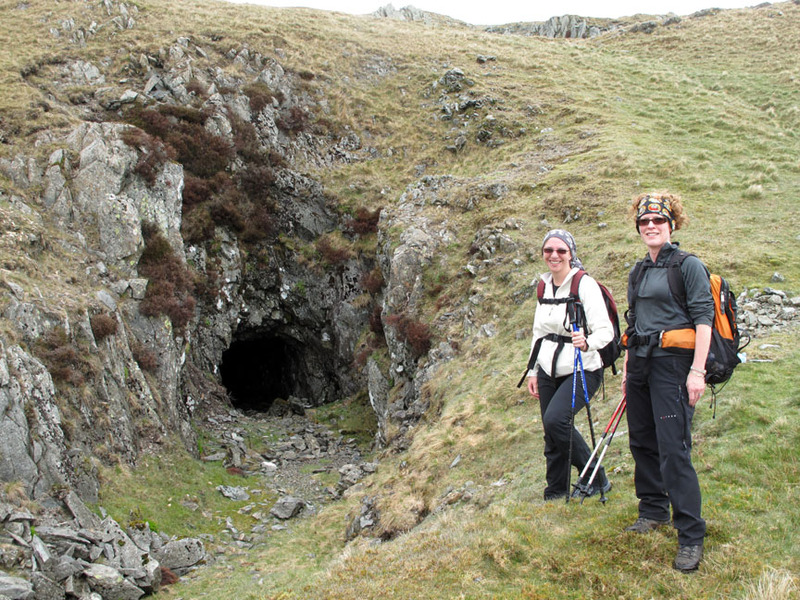 Mini adventure over, we reach the rounded summit of Hindscarth. 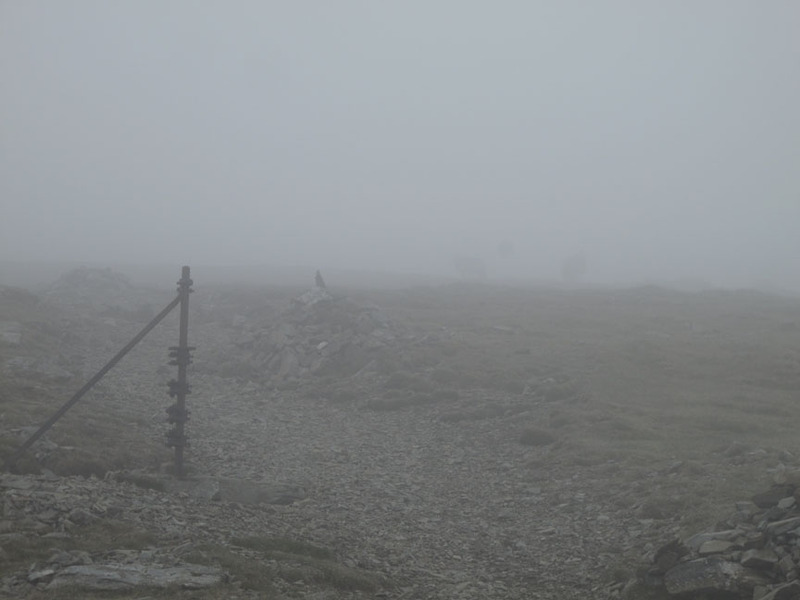 The view north, down past the large but lower wind shelter one hundred yards away was missing. 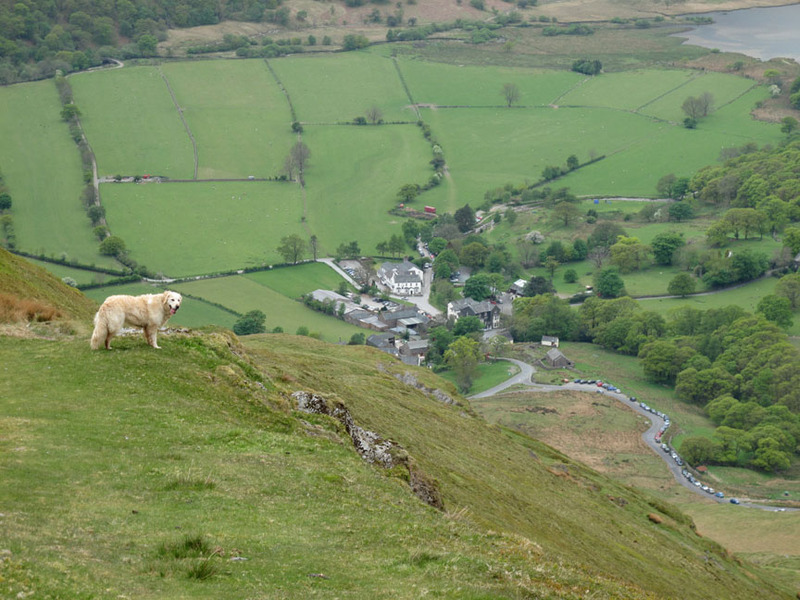 named after the short valley of Little Dale between Hindscarth and Robinson. 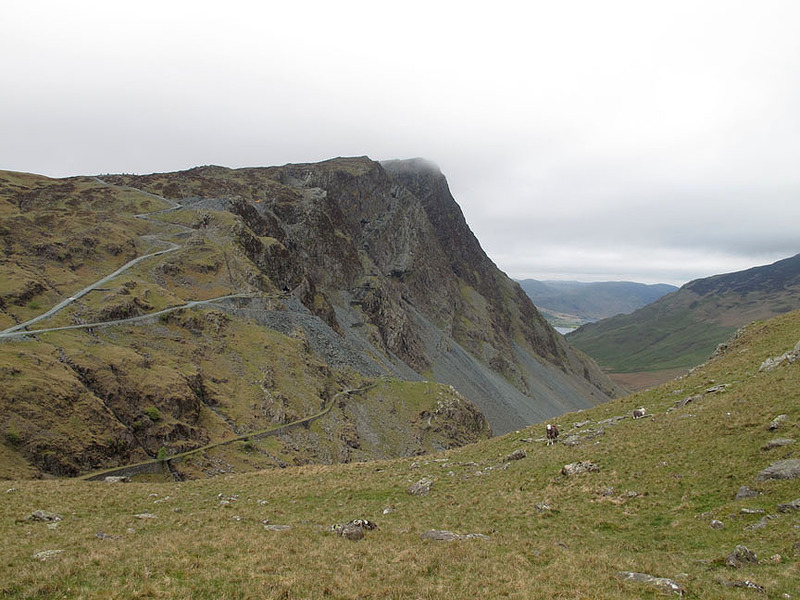 Looking back we could see our outward route from Honister with the Yew Crag mines on the left. 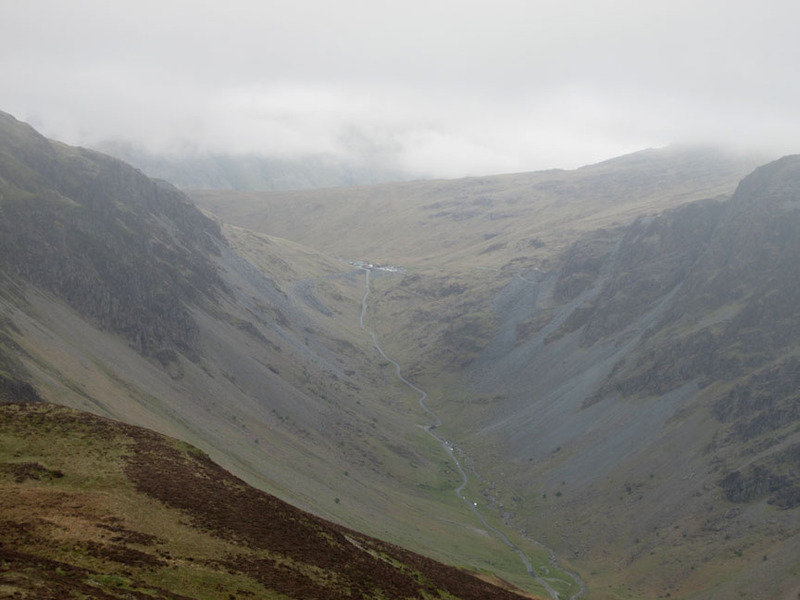 and the path from Gatesgarth across and up to Honister that Kathy and Lou had also done this week. 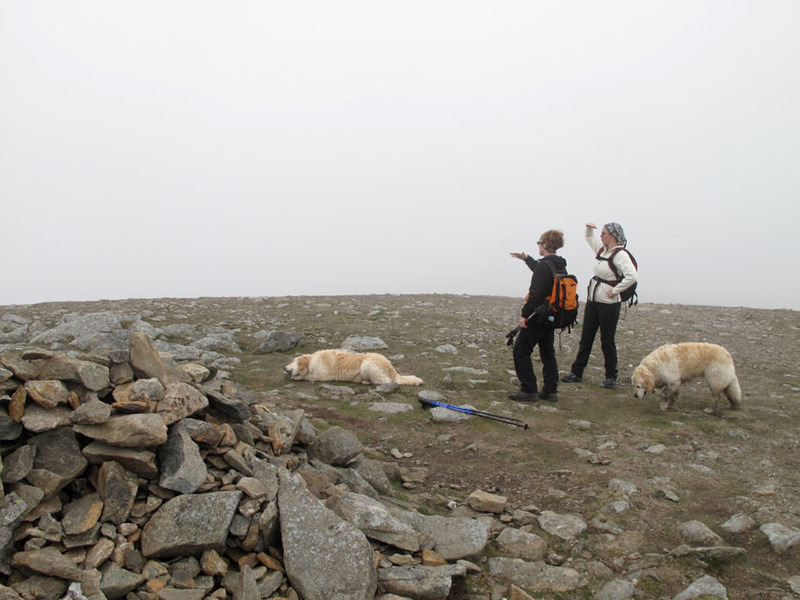 A steep pull brought us up Robinson Crags and a right turn at the cairn would take us out to the true summit. 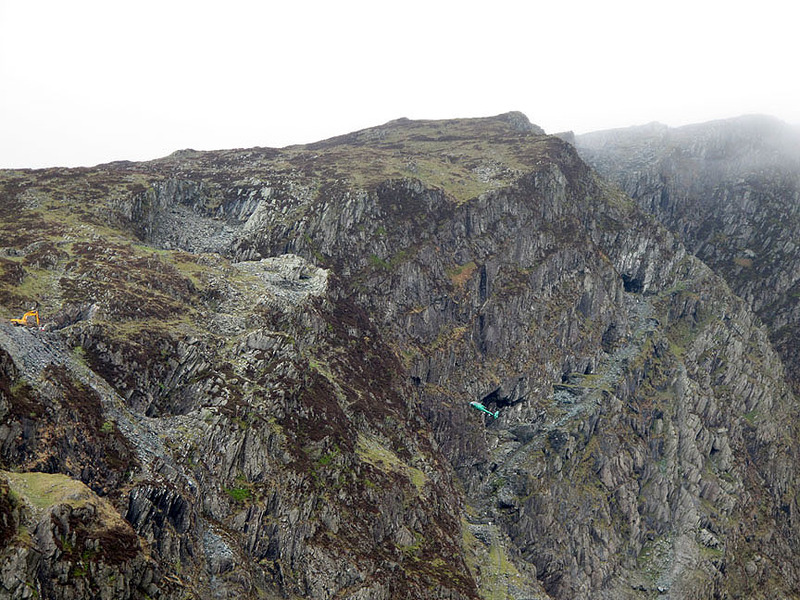 The distinctive flat area bounded by two rock strata walls typifies Robinson top. 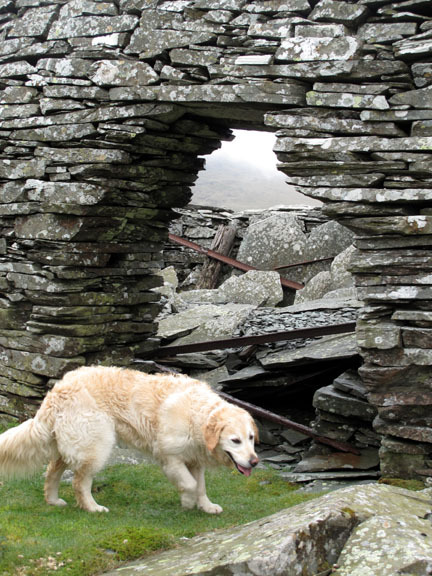 The small shelter and additional four stones on it defined the highest point. 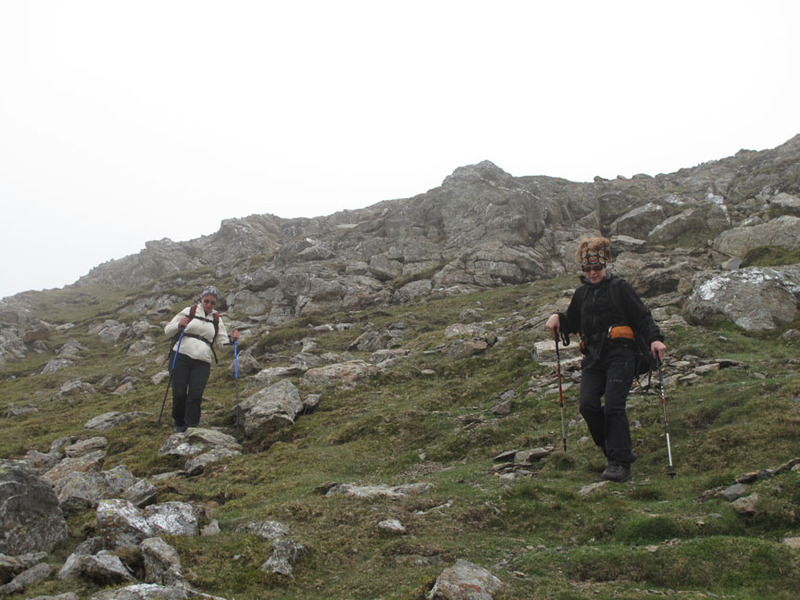 but we chose to leave the summit close to the shelter and make our way steeply down following a second path. 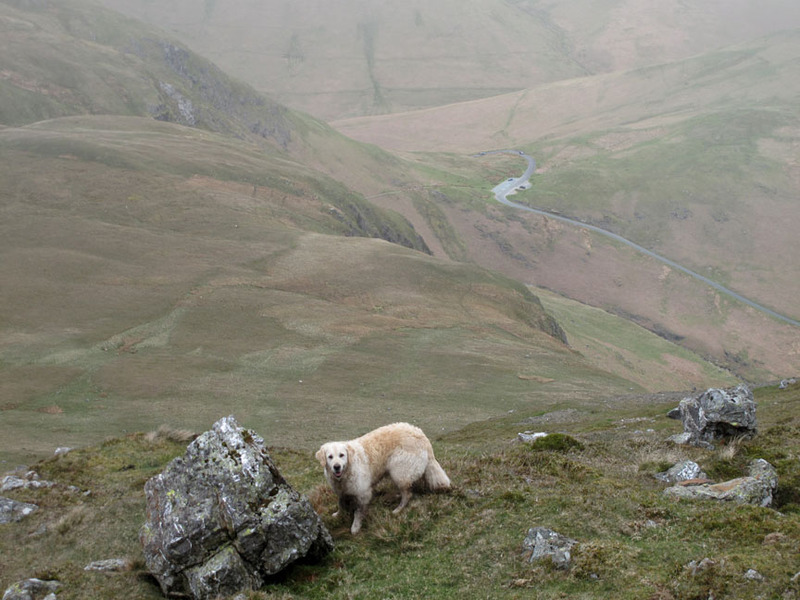 where the road crosses from the Buttermere Valley into the Newlands Valley. 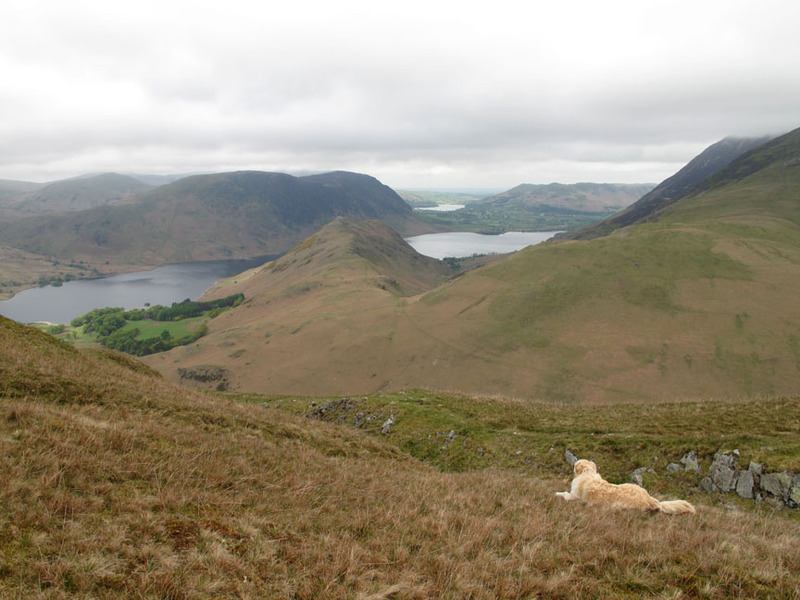 First views of Rannerdale Knotts and Loweswater beyond. 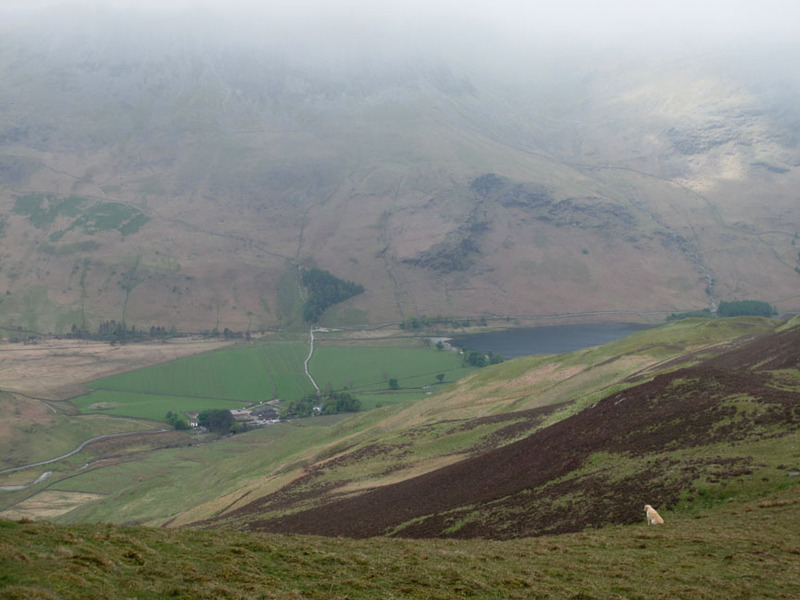 Our steep descent brought us across the middle of Buttermere Moss but with the recent dry weather this was no problem . . .
just one damp section to negotiate and we were back on solid ground. The views here were of distant Catbells in a patch of sunshine no less. Clear views now as we descend the peat track. 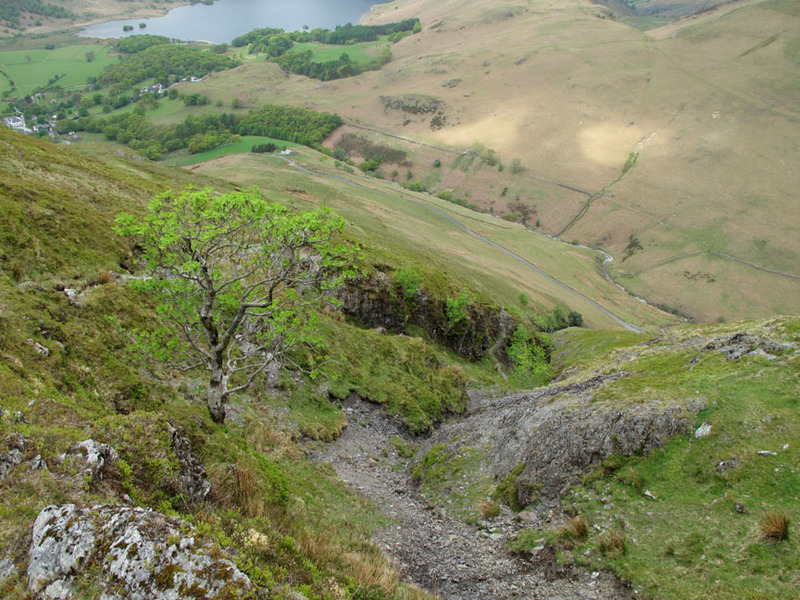 It would zig-zag its way from High Snockrigg down into Buttermere Village. A determined Herdwick stamped her feet at the thought that we might want to pass and cause her to move. 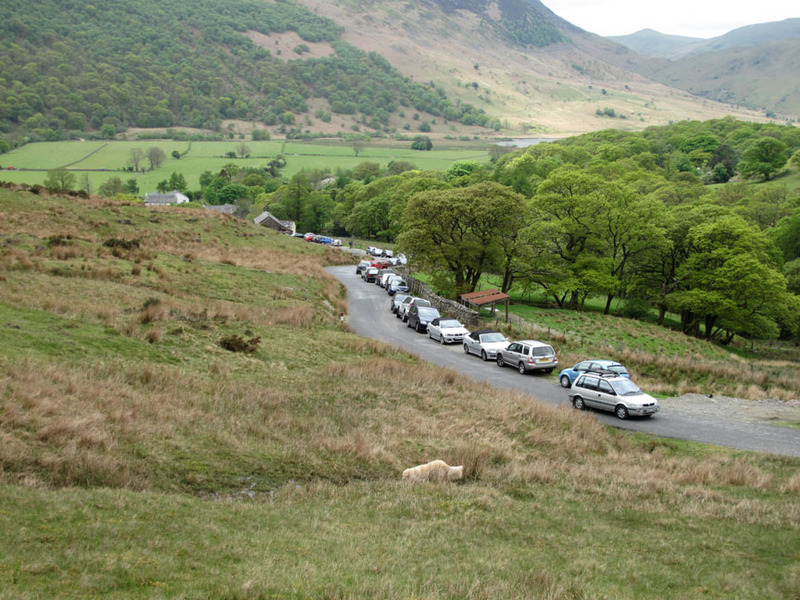 and the cars of the numerous visitors lined up on the road below. but we'll take an 'avoid the traffic route' and head across the grass directly towards the hostel. Back where we started I think it can be said . . . Same place, dirtier dogs. Oh yes . . . we had to go and fetch the other car . . . well you've got to travel in style ! 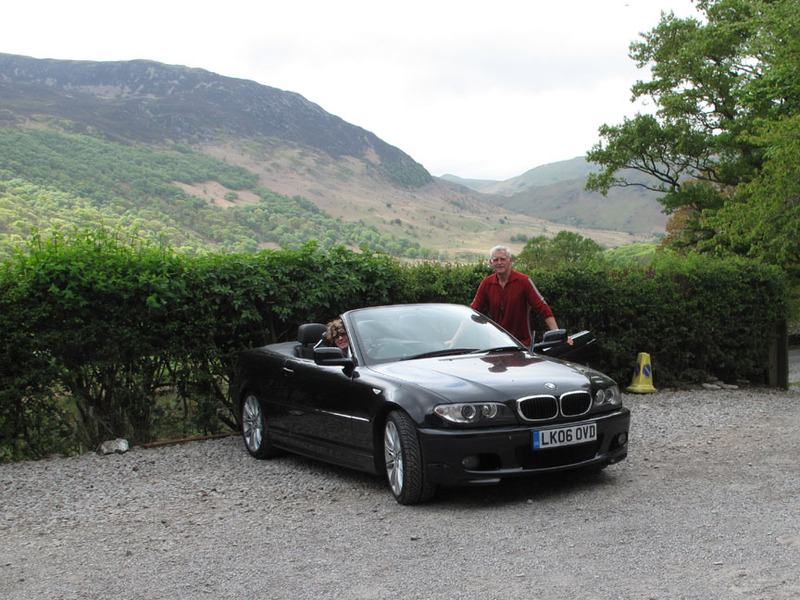 Roof down and we'll really be able to enjoy the Honister Crags to the full a second time as we drive back up. Technical note: Pictures taken with my Canon G10 digital camera. This site best viewed with . . . Soup and home made bread lovingly prepared by Ann during the morning back at home.